The design holds a new back compartment for fighter squadron ops, which can be directed by using the tactical holo-table. It is called the Mission Ops center, and can also be used for other away missions. The large area in front of CONN and Ops can also be used to tactical holographic displays as required. Nice layout, but shouldn't communications be closer to the central hub; perhaps the unassigned station to the left of mission ops? Even with directional acoustics funneling sound in specific directions, is it really a good idea to require your communications officer to project across half the bridge to get the captain's attention? Thanks, and good idea! I might change it at some point. Thanks! 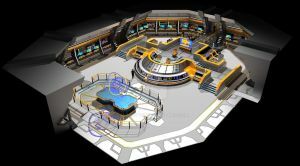 Just want to say that you are very creative in making this bridge...the only thing I would like to say that it doesn't align with your original bridge layout with the command seating is like voyager with the first officer besidesign the captain...in this layou only the captain. Do you have an explanation? ?? Changed the design, and I have yet to update the Deck 01 floor plan to match it. I like a lot about this bridge, but what is the purpose of having those big honking struts all over the place? Trek bridges tend to be more open plan than that. And yes, I know JJ did it too...didn't make sense to me then either. Still, nice 25th century bridge! *thumbsup*. Thank you! If nothing else, those science officers on the starboard side won't be distracted by the viewscreen, that's for sure. I like the struts, it seems odd to me when I see such genorus use of space on a star-ship as is in the typical bridge, if it has strutual elements running though it that maked it a bit more believable, not to mention that the open plan thing paradoxically makes the bridge the least defendable part of most ships. WE NEED AN IRAY VERSION OF THIS FOR DS. A version that can be used in DAZ Studio, with Iray materials.